and thank you for visiting the Tollesbury village website, an online resource for both residents and visitors. We hope you find the content on the website helpful and informative. If you want to make any comments please do so via the Guestbook or drop us an email, the addresses are on the Contact Us page. The village of Tollesbury is situated on the Essex coast at the mouth of the River Blackwater, 9 miles east of the historic port of Maldon and 12 miles south of Colchester, Britain's oldest recorded town. You can see from the map on the left that the village sits on a small peninsula, to the north is Tollesbury Fleet and Old Hall marshes, to the south the River Blackwater. 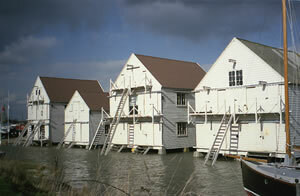 Its location makes the village popular with bird spotters, walkers and of course sailors. Because of it's geographical situation Tollesbury has for centuries, relied on the harvests from both the land and the sea and the village has become known as 'The Village of the Plough and Sail'.